Here’s a message from Park Committee Chair Sheri Kennedy. What an incredible day we had in the Park on Saturday!! The weather was totally perfect. 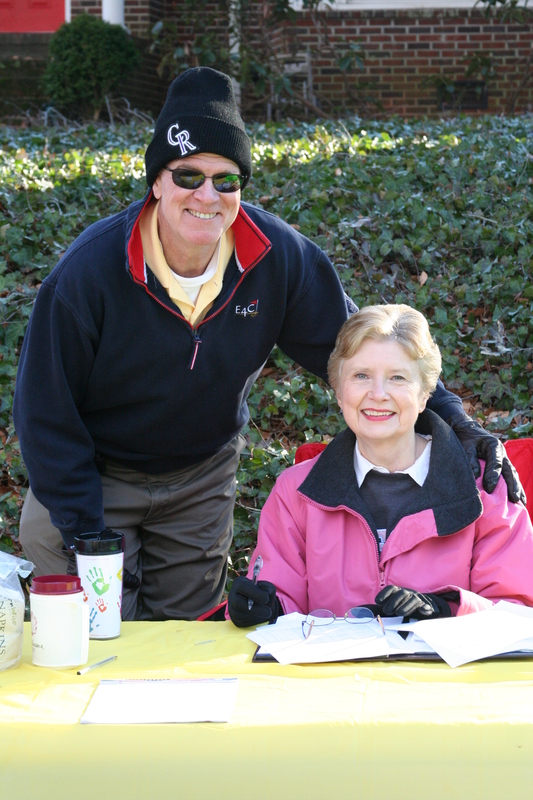 We had OVER 30 volunteers — both PGC members and non-members! 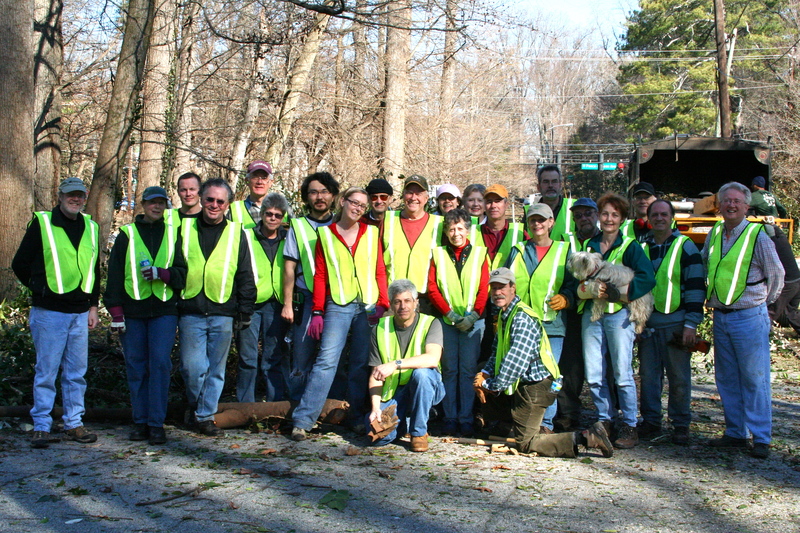 Thanks to all of you that worked so incredibly hard on Saturday!! Thanks to those of you who worked around our road closures and the chaos!! 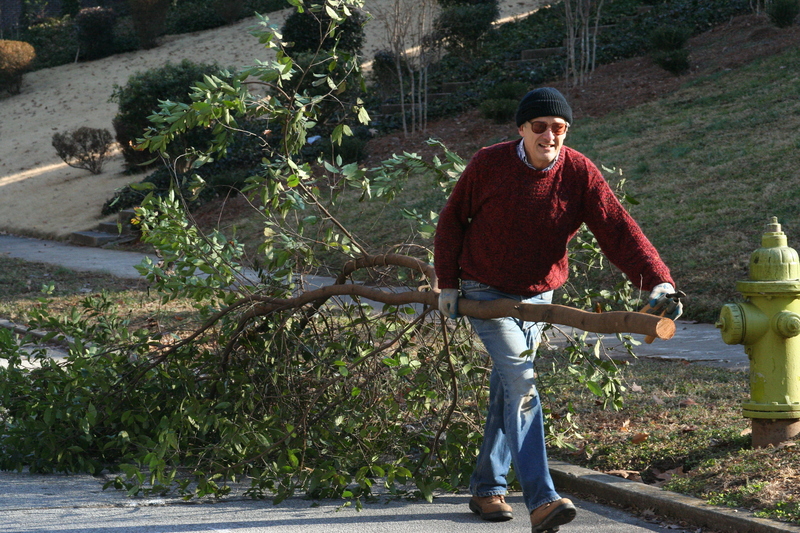 Volunteers started arriving promptly at 9 a.m. and many worked until 4:30 p.m. when the chipper finally stopped. We started on the E. Parkwood side and faced the challenge of an overwhelming amount of debris as well as deep embankments. Some used ropes while others formed a chain of people to pass the debris up the embankments. Some just climbed up the huge embankments with an armload of cherry laurel!! It was quite an effort!! We tackled W. Parkwood after lunch which included a huge area near W. Ponce full of tree-like cherry laurel. At the end of a very long day we chipped over 63 cubic yards (3 truckloads) of debris. Thanks so much for the continuing support to revive our Park to a better state of health, beauty, and accessibility. We are planning another neighborhood-wide meeting about the Park in early March to talk about what comes next and will update you on the date ASAP. Some tools were lost Saturday morning and others were found. FOUND: Two loppers, one with a red handle and one with a wooden handle. Contact Sheri Kennedy via email or call 404.377.8218 to claim. 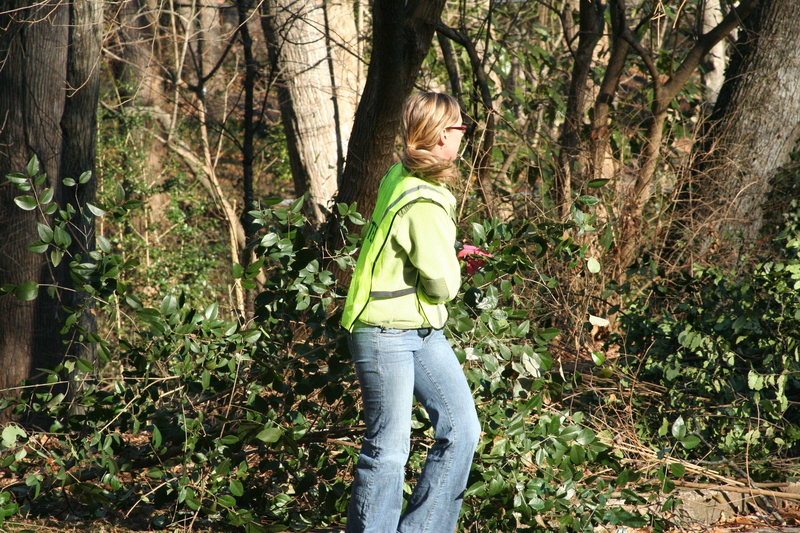 LOST: Green pruning shears (probably lost on the embankment by the cut-through on the E. Parkwood side of Park). Email Rebecca Kerimbaev or call 770.369.5710 if found. Check out the video below of the chipper demolishing invasives and exotics like paper through a shredder. 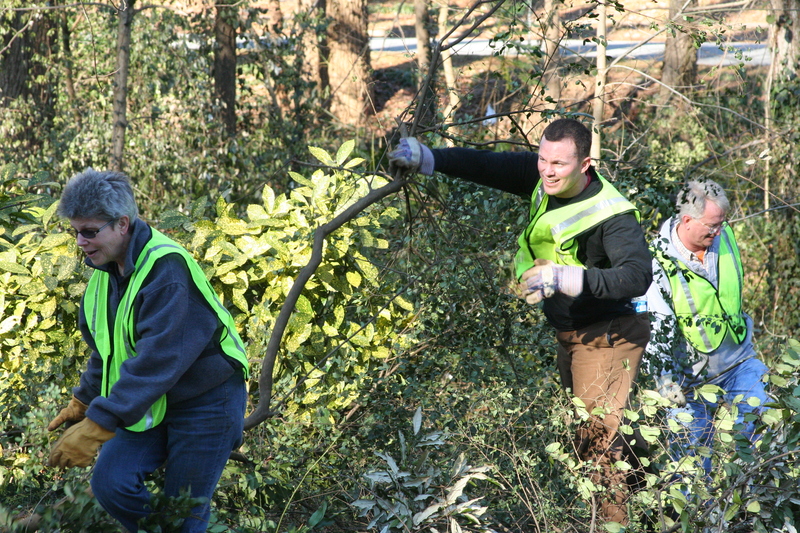 To see 75 great photos of the Park and neighbors on Clean-Up Day, click here. 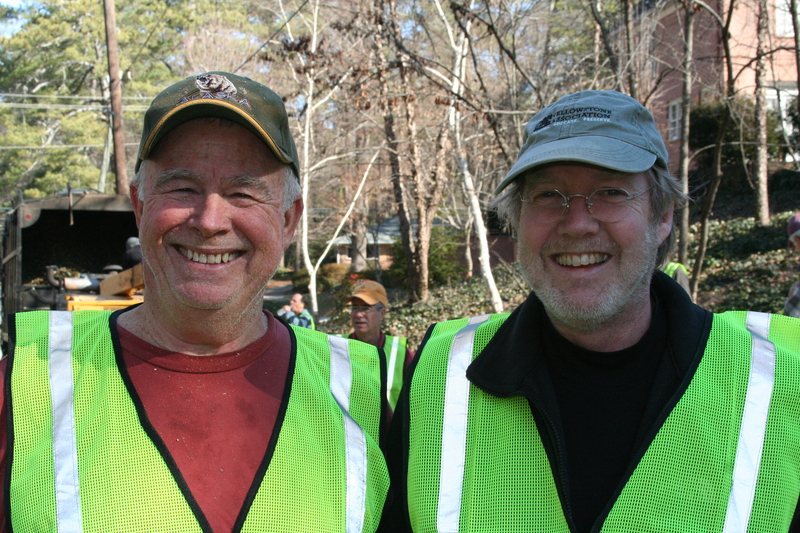 Thanks go out to the Druid Hills Civic Association for funding our chipper during two Clean-Up days! Big thanks to neighbor Erin Elmore for taking all these photos Saturday and to Mary K Jarboe for womanning the sign-up table. The Park Committee reminds members that all Park Committee Meeting minutes are available on this website for you to read at your leisure. They are located in the protected Members Only section of the righthand side bar of every page. 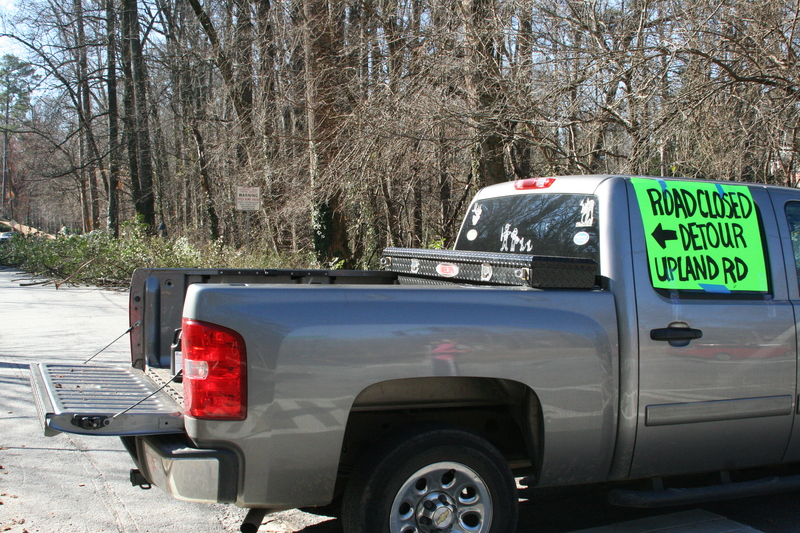 For more information on getting involved in Park beautification and clean up, contact Sheri Kennedy. Finally, the PGC sends a big THANK YOU to Sheri Kennedy, Jim Kennedy, Steve Elmore, Bob Stewart, Jim Jarboe and anyone else who spent mornings and afternoons before the Clean Up Day chainsawing and lopping in preparation for Saturday’s chipping. The Clean Up could not have been a success without you! This entry was posted in events, Parkwood Park, plants. Bookmark the permalink.